Large Popcorn, No Butter: Scots and Gingers and Bears--Oh My! So really having nothing to go off of from the preview except for that looping phrase, "If you haad the chaance to cheenge yer feet...would yew?" I was just kinda putting my faith into the Pixar logo, as so many of us do. The plot of the film, if you got the vibe from the previews better than I did, is that Princess Merida is being forced to choose a husband with which to rule her father's kingdom. The three neighboring clans (who don't get along very well) all come bearing their sons in hopes of winning a competition and therefore Merida's hand. 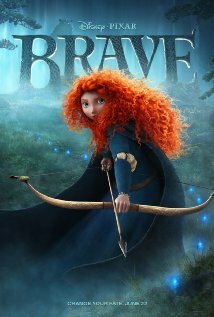 But Merida is an unruly and adventurous teenager who doesn't feel ready to be married. Kept in line by her proper mother, despite taking more after her father, Merida is dying for the chance to just be herself and live outside the princess rules that weigh her down. 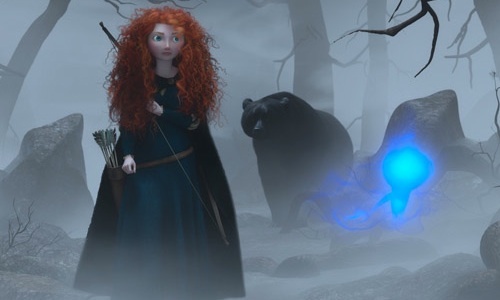 In order to change her fate (cheenge her feeet), Merida is led by whisps (mystic Scottish things that look sort of like oversized misty water drops) to an old witch that can help her change her mother. 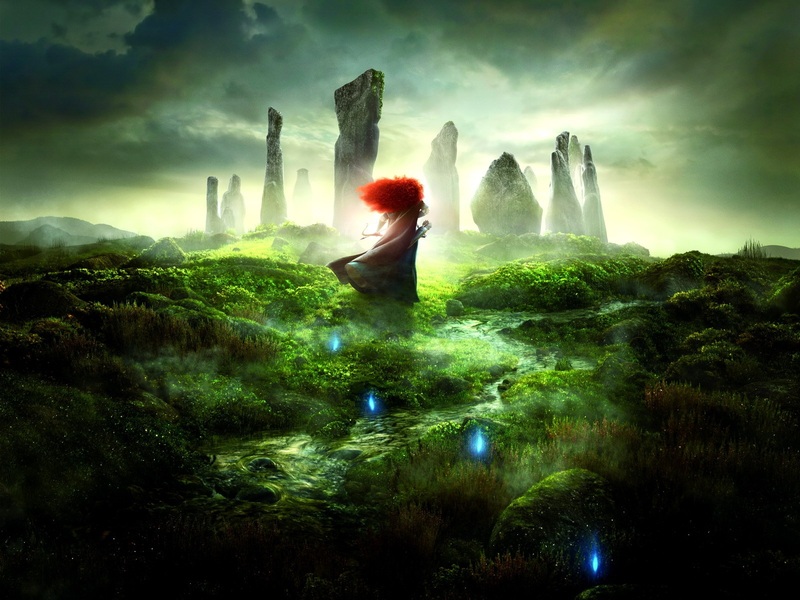 But the results of the witch's help leave Merida with something that she had never asked for, and now she has to fix what she's done before it becomes permanent. So, first of all, let me get the obvious out of the way and just say: holy crap this movie is gorgeous. I don't know how the hell they pack so much detail into their sets while maintaining the mysticism of the era and adding cartoon-like characters that nonetheless are heartbreakingly realistic and wonderfully hilarious. Also the fiery vibrance of Merida's hair in contrast to the lush green of Scotland's landscape really reels her in as the focus of this movie. Lighting, sounds, and design are all breathtaking in this film. Once again, Pixar, well done. Ya did good, kids. In short, this film isn't bad at all, but its brevity leaves a little something to be desired for the older crews. For kids' films in general it's a beautiful adventure tale, but for Pixar, it seems to be down there with Cars. OMG, I forgot! If you need a reason to see this, though, please PLEASE see it for the ADORABLE short that prefaces the film. It's literally one of the cutest things I've ever seen. Seriously.